While working in the garden yesterday morning I was suddenly alerted to a noisy confrontation nearby. Our resident Willie Wagtails love to frequent one particular spot where there is an abundance of insects. 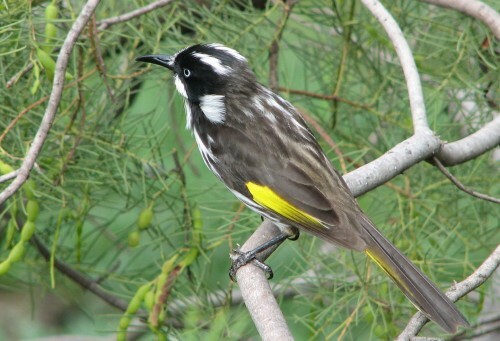 Suddenly a New Holland Honeyeater dived in to reap his share of the smorgasbord. The Willie Wagtail became quite aggressive, fanning his tail up high, ruffling the feathers all over and calling in what seemed to me to be in quite an angry – perhaps even distressed – way. The honeyeater retreated to a nearby tree, only to swoop in repeatedly over the next few minutes. Each time the honeyeater would snap at the Willie Wagtail, zip away a metre or so, grab another insect, and retreat hurriedly to the refuge tree. These attacks seemed to trigger even more aggression in the Willie Wagtail who decided to front up to the interloper. They then faced each other at about ten paces (bird step size – about 10cm) angrily calling in each others’ face. One last beakful of food and the New Holland Honeyeater decided that other parts of the garden were more attractive anyway, and it flew off. The Willie Wagtail continued to feast contentedly on his little patch. This post updated in September 2015. I now believe ravens definitely swoop in AustraliaI. I had an rake upstretched knocking off loose bark on a 15m gum tree . As I did this a raven came swooping down at me.This happened repeatedly with a second raven joing in from a different direction. The last time, minutes later it was chased off by my friendly willywagtail. The following morning while I was stooping down to weed the lawn I received a thump on the back, twistd my ankle as I fell forward and looked around to see the raven disappearing and making his dreaded noise. A pair regularly sit high in the gum tree but there is no obvious nest. They seem to be very patient and wait for an opportune moment,then swoop down wings flappipng wildly anytime I appear in my garden. I now keep a watchful eye out anytime I venture into the garden. Thanks for visiting and for sharing your unusual experiences with ravens. This is most unlike raven behaviour in my experience. I’ve checked through all of the entries on ravens in HANZAB (Handbook of Aust NZ and Antarctic Birds) which is a thorough compilation of all the research and literature on our birds. There is no mention of them ever swooping, so your observation is quite unusual and significant. Thank you for sharing. I came accross this site when looking…I have crows or raven hassling me again but more aggressive now. Last year they were nesting outside my window in a gum tree,and I drove them out,finally..it was a nightmere,they woke me every day at 5am and back at 5.10pm.. I used audio,and visual..finally winter was quite ish. Recently they started aggressively culling other birds who had taken up residence in surprised morning attacks..these minors I think,fought back hard,and I was out there yelling at the cullers. Am noise waking me up,and swoop attacks. They won’t go away…I’m terminally ill..I don’t need this…they attacked my dog,scaring him also.. I need help..I have tried everything,hence them leaving the first time. Never have I been swooped on by a bird…but these Raven/ crows been so insistent..
I’m scared..and they won’t leave..I have there droppings everywhere too.. I am sorry that I didn’t answer your question at the time. Somehow it slipped through with the many comments I get. 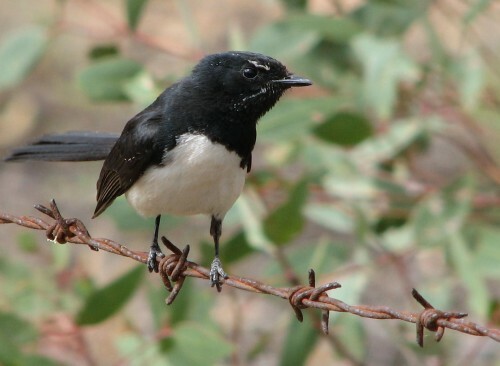 The Willie Wagtails must have a nest somewhere near and they are just protecting their eggs or young. Things will return to normal once the young leave the nest.